For the past six years we have taken students, relatives, neighbors, friends, and friends of friends to the site of the temporary memorial of the Heroes of Flight 93. 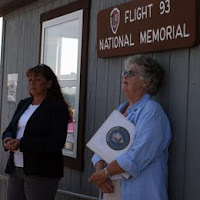 Once there we listen to Janie Kiehl, a Flight 93 Ambassador and dear friend tell the story of United 93. Val McClatchey another good friend, explains the history of her famous photograph, The End of Serenity. Chuck and Jayne Wagner, Flight 93 Ambassadors, are usually on hand to help us and their daughter, Leigh Snyder provides our guests with her book, Patriots of Peace. 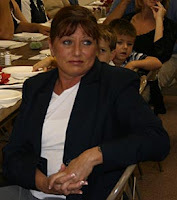 At the Lutheran church hall we come together in a community dinner compliments of Janie Kiehl and her family. This year Val McClatchey shared a priceless piece of history with our guests. She played a DVD of the amateur video recorded in Berlin, PA, of the aftermath of the end of United 93 and the now famous plume of black smoke that looked like a mushroom cloud. For Val McClatchey it was a moment of vindication. It gave lie to the conspiracy theorists. For those of us in the room, it was a chilling moment of discovery and verification of what Val’s picture had recorded for millions of people around the world. We were watching moving images of The End of Serenity. We were experiencing an historically significant event. Why did it take 6 years for this reported amateur footage to surface and when does the rest of the world get to see it? This video was reportedly filmed in Berlin, PA, which is about 9 miles SSW of the crater. Remember that the wind near the crater was reported blowing 9 knots in a SE direction. Also note that I've never suggested that there wasn't an explosion in that empty Shanksville field, or that there was never any smoke being emitted from there. I do not even doubt there might have been a mushroom cloud there after whatever exploded. I just doubt than any mushroom cloud that may have formed over the immediate area around the crater grew to a whopping 700 yards wide, the width that I estimate the plume in Val's photo had to be if it was near the crater. yeah, where is this video? if she wants vindication, wouldn't she release it so that it can be proven? Haha how can this amateur video not be a lie? Like the other comment says, vindication won't come until we can actually see-just like all those Pentagon attack tapes we can't view; I mean seriously, they only caught that grainy glimpse, with all the profusion of cameras on the building? suuuure. An *article* about the alleged Shanksville video is supposed to be proof? And the official guys call us nuts?